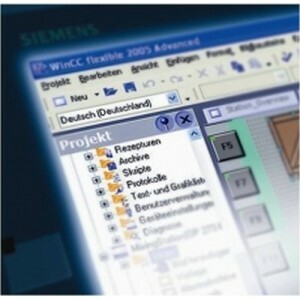 SIMATIC WinCC Runtime Professional is available as a software package with 128, 512, 2 048, 4 096, 8 192, 65 536 PowerTags. PowerTags are data points that are connected to controllers or other data sources via a WinCC Runtime Professional channel. Up to 32 alarms can be obtained from one data point. Moreover, internal tags without coupling are available for additional system performance. WinCC Runtime Professional also contains 500 archive tags. Additional archive licenses can be obtained for greater quantity structures. The system software with the required number of PowerTags and additionally the SIMATIC WinCC Server for Runtime Professional option must be installed on the server. For the clients in the basic configuration, a SIMATIC WinCC Client for Runtime Professional license is sufficient.